A S.M.A.R.T. goal is a framework for you to figure out the steps that you need to do to achieve your goals. An idea plan helps you think through everything you need to do and prepare for before jumping into your project. 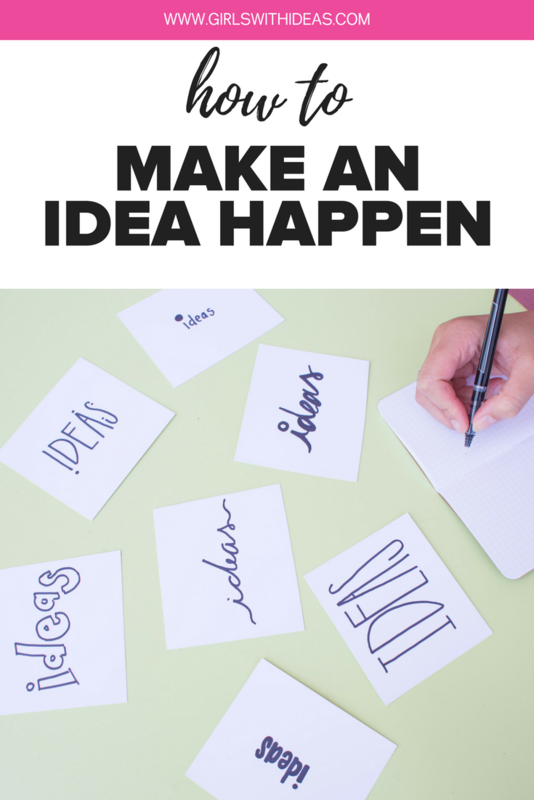 We wanted to help you take that idea from your head and make it a reality so we are doing a mini blog series with tips on how to make your idea happen no matter your age! "I have an idea! Can you help me?" This is one of the most frequently asked questions we get at Girls With Ideas. Our curriculum discusses in depth about how to do just that for girls in grades 4th-8th grade. Great news, you can get it HERE! However, we wanted to help you take that idea from your head and make it a reality so we are doing a mini blog series with tips on how to make your idea happen no matter your age! Read more from this series by checking out our other blogs on this topic! The very first thing you should do when you have an idea is to research if someone else is working on your idea! You may find that someone has already started an organization or business that you would rather support or help instead of starting your own. You can contact that organization and business and see how you can help or provide them some ideas to make their idea even better! Some good examples of this are non-profit organizations. Say you want to help tutor kids after school. Before you start your own non-profit tutoring program, see what's out there. If there is one that you feel is doing things well it may be better to support and amplify their program rather than start your own. If nothing else, volunteering for that program could give you insight and ideas on what is needed to run a program and you can always start your own later if you feel that you could have a program that does things differently. You should also do market research to see if you idea is something that people want. You can research online to find out if people are buying a similar product or service, how much they pay for it, and what competitors you would have. You can also go to the library and ask the librarian to help you find market research reports on certain industries to help get this information. Then it's time to start researching! they may have ideas or resources to help you. you can get feedback on your ideas. it shows if there is an interest in what you are doing. it's a lot easier to do things with the support of other people! What should you ask people? In the startup world, people often call talking to others 'customer discovery.' This process allows you to learn about your potential customers, clients, or users. You want to ask people questions that get at if your idea solves a problem they have, if it is something they would be excited about, and also to gain insight on your potential customers. So if you wanted to start a tutoring program in your community, you could ask questions about how people currently get help with school, what subjects they need help with the most, what kind of things help them learn, who they best learn from, if they would pay for tutoring, how much work they do outside of school hours etc. One way that you can get information from other people is to conduct an online survey. This is a good way to get quick responses from a lot of people. It is also helpful because you can compare people's answers to the same questions. Make sure to ask about people's age, gender, and location (city or state) in the survey if that information is helpful to you later when looking at their answers. However, if you put a survey out on social media you may get mostly friends, family, or people you know. They may know about your idea and be more nice than honest, so it's important to keep that in mind. It's also important to make sure to send your survey to people you don't know! You can email groups in your community to pass it on to their members or ask your friends to send it to people they know. Another way to interview people about your idea is to talk to them face-to-face! This can be intimidating but it is the best way to get information because you can ask follow-up questions and see people's body language when giving answers to gage their sincerity. The key to doing this is to come with a list of questions and ask the same questions to all the people you interview. It is best to record the interview so you don't have to take notes and be engaged in the conversation. Then you can listen to the conversation back and write down their answers. This is more time intensive than a survey, but it gives you more information and allows you to ask follow-up questions. Time to get to work! Get out there and do your research. When you're ready to move on to your next step, check out our other blogs in this series!